At the end of January, European and world leaders observed the 70th anniversary of the liberation of Auschwitz. It was an important event, reminding everyone that the horror of the Holocaust must never become a mere distant memory; it must never be forgotten. The irony of this memorial at Auschwitz is that anti-Semitism is evident again in Europe, despite the pledge of ?Never Again? echoing from Auschwitz. What evidence is there that anti-Semitism is once again raising its monstrous head? The murder of Jewish shoppers at a Parisian kosher supermarket in early January, after 12 people were also killed at the offices of the satirical magazine, Charlie Hebdo, is part of a pattern emerging in Europe and in other parts of the world: In 2014, four Jews were killed at the Jewish Museum in Brussels. In 2012, a rabbi and 3 young children were murdered at a Jewish school in Toulouse. In 2008, in Mumbai, four terrorists murdered a young rabbi and his pregnant wife after torturing and mutilating them. The Sunday Times of London reported that ?the terrorists would be told by their handlers in Pakistan that the lives of Jews were worth 50 times those of non-Jews.? As Jonathan Sacks, emeritus chief rabbi of the United Hebrew Congregation of the British Commonwealth, observes, ?The targets in these cities were not Israeli. They were Jewish.? Muhammad Hussein Yaqub, speaking in 2009 on a popular Egyptian TV station, made his hatred for the Jews clear when he declared: ?If the Jews left Palestine to us, would we start loving them? Of course not. We will never love them . . . They are enemies not because they occupied Palestine. They would have been enemies even if they did not occupy a thing . . . You must believe that we will fight, defeat and annihilate them until not a single Jew remains on the face of the Earth . . . You will not survive as long as a single one of us remains.? An Anti-Defamation League (ADL) study released last May found ?persistent and pervasive? anti-Jewish attitudes after surveying 53,100 adults in 102 countries and territories worldwide. The ADL found that 74% of those surveyed in the Middle East and North Africa held anti-Semitic attitudes; the number was 24% in Western Europe, 34% in Eastern Europe and 19% in the Americas. A 2011 Pew Research Center study discovered that favorable views toward Jews was ?uniformly low? in predominately Muslim regions that it surveyed (e.g., Turkey, Lebanon, Egypt and Jordan). Jonathan Sacks also correctly concludes that since the Crusades, ?Jews in Christian Europe began to be seen not as human beings but as a malevolent force, a demonic and destructive power that mysteriously yet actively sought the harm of others . . . This period added to the repressive vocabulary of the medieval West such terms as book burning, forced conversion, Inquisition, auto-da-fe, expulsion, ghetto and pogrom. In duration and intensity, it ranks among the most sustained chronicles of enmity in history.? Anti-Semitism is deeply ingrained in Islam as well. For example, coming out of medieval England (about 1144), the blood libel is now a given in much of Islam. At bottom, it is the idea that Jews kill Christian children to use their blood to make matzo, the unleavened bread eaten during Passover. It is still a viable idea in Islam. In 1983, Syrian Defense Minister Mustafa Tiass endorsed it in his book, The Matzo of Zion. In addition, equally deep in Islam is the 19th-century forgery sourced in czarist Russia about a global Jewish conspiracy called The Protocols of the Elders of Zion. A favorite book of Hitler, The Protocols was introduced into the Middle East in Arabic translation in the 1930s by the grand mufti of Jerusalem, Hajj Amin al-Husayni, who spent World War II in Berlin, as a Nazi sympathizer and advocate in the Arab world. This nefarious book continues to be reprinted and widely read in the Muslim world and undergirds the terrorist groups of Hezbollah and Hamas. As the columnist Charles Krauthammer demonstrates, the Muslim Middle East constitutes the heart of global anti-Semitism, ?a veritable factory of anti-Jewish literature, films, blood libels and calls for violence, indeed for genocide. The founding charter of Hamas calls not just for the eradication of Israel but for the killing of Jews everywhere. Hezbollah chief Hassan Nasrallah welcomes Jewish emigration to Israel?because it makes the killing easier: ?If Jews all gather in Israel, it will save us the trouble of going after them worldwide.? And, of course Iran openly declares as its sacred mission the annihilation of Israel.? Finally, in one of the most bizarre incidents in the publishing industry, for months, HarperCollins has been selling an atlas, the Collins Middle East Atlas, that it says was ?developed specifically for schools in the Middle East.? It provides ?an in-depth coverage of the region and its issues,? and it seeks to aid children in understanding the ?relationship between the social and physical environment, the region?s challenges [and] its socio-economic development.? On its pages are details of Syria, Jordan, Gaza?but no Israel!!!! The West Bank is even in the atlas, but no state of Israel. From a major publishing house, this is an unimaginable atlas for them to publish. HarperCollins has now removed this atlas from sale and has promised that all of its ?remaining stock will be pulped. HarperCollins sincerely apologizes for this omission and from any offense it caused.? As one reviewer argued, ?It is incredibly sad and sickening how one of the world?s largest publishers has failed to recognize Israel.? It is a ?travesty and international shame.? ?Failure to recognize its existence is horrifying and it?s a shame that in 2014, such nonsense still goes on.? Pandering to the anti-Semitism of the Middle East is the only explanation for such stupidity, but it also illustrates the base depravity of humanity. In the Gospel of John, chapter 4, Jesus was having an extended discussion with the Samaritan woman. Much of their discussion centered on worship. Samaritans worshipped God on Mount Gerizim, while the Jews worshipped God in Jerusalem. Of course, Jesus emphatically argued that worship is not about geography. It is based on a vital relationship with God based on faith. Among other points, Jesus concluded that she needed to understand that ?salvation comes from the Jews.? 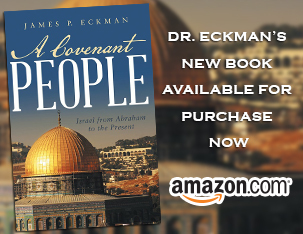 God made an unconditional, unilateral covenant with Abraham, the father of the Jews (see Genesis 12). That covenant frames the entire Old Testament and provides the foundation for the New Testament as well (see Galatians 3-4). Jesus Christ was a Jew and His death, burial and resurrection are the essence of that part of the Abrahamic Covenant, “in you all the nations will be blessed.? The future salvation of the Jews living when Christ returns is at the heart of Paul?s argument in Romans 11:26. Therefore, it is reasonable that anti-Semitism is energized and empowered by supernatural power. What one being in the universe stands opposed to God?s redemptive purposes? Satan. Hence, anti-Semitism and its virulent, vitriolic hate are only explained by the kingdom of darkness. Anti-Semitism is a grotesque, ugly force in human history. For those of us who love Jesus Christ, we must condemn it and fight it with all the fervor we can muster.